By comparing the product prices between 2 chemists/pharmacies, Chemist Warehouse is the cheapest. It is $24.50 (58 %) cheaper than next price leader (Discount Drug Stores). The current price at $17.49 is $24.50 (17 %) more than the historical cheapest price of $14.99 recorded on 14 May 2018. 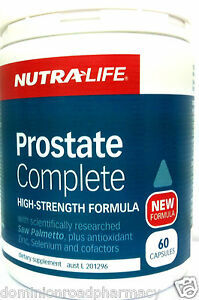 Similar product NUTRA LIFE -PROSTATE COMPLETE - HIGH STRENGTH FORMULA NUTRALIFE 60 Capsules can be found at ebay Australia at $38.90.